I was timidly approached by a small, elderly patient of mine. I knew that she was Korean from reading her history, but was surprised when she asked if I was Korean. I said that I was and she nodded approvingly. Her voice was quiet and her accent was thick, but she immediately seemed to be at ease with me. She asked me how long I’d been here, probably judging by my lack of accent, and I told her all my life. She nodded again and I asked how long she’d been here. She said since 1998, and I asked how she liked it. Her nose crinkled and she said that it rained too much. I laughed, thinking of my own childhood spent in Southeast Alaska. No amount of rain was “too much rain” compared to that. She asked me how old I was and if I was married. I told her, 30, and no, not married yet. She nodded again, understanding and told me her own son was not married yet. Not in a, “you two should meet,” sort of way, but in a, “it seems that times are changed since when I was your age,” sort of way. I told her as much. Too many things to occupy us these days, school and more school, difficult jobs, it takes time to find the right one. She nodded and then asked if I’d been adopted. I smiled and said yes, when I was a baby. She asked if I went to Korea. I told her no, not yet. But I wanted to soon. She mused that it was probably very different now… This time I nodded. She seemed far away, and yet right here all in the same moment. Finally after some moments of silence, her eyes met mine, and she told me that she was very proud of me. She probably would never know how much it meant to me, right now when I am having so many thoughts and curiosities about my heritage and my birth mother, to hear those five words. I was able to hide some of my watery eyedness in the glare of the sun. I finally took a breath, and thanked her. 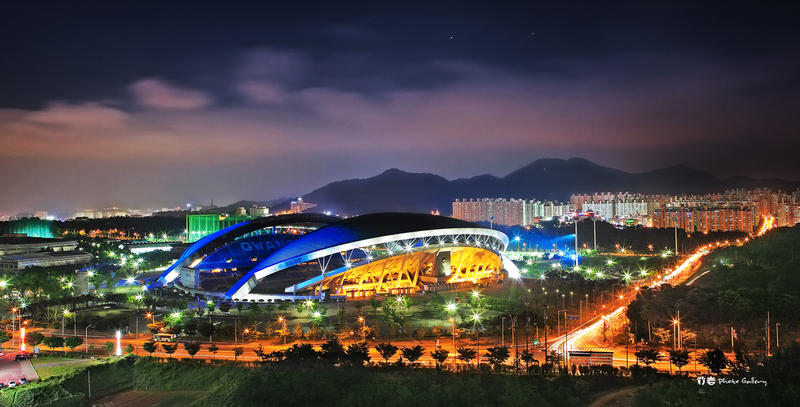 Photo credits: Images of Gwangju, South Korea. Called The City of Lights. The city where I was born.